Kyabram is a provincial township in northern Victoria, situated in the west Goulburn Valley irrigation area. It is 35 km west of Shepparton. During the 1870s when pastoral runs were subdivided for farm selections, a township site was reserved for the west Goulburn Valley. The place chosen was adjacent to selections held by J.E. and D. Edis, and Edis was one of four selectors who made overtures for the reservation. Township blocks were sold in 1876. The township was named Kyabram, derived from the prior parish name, which is thought to be from an Aboriginal word meaning thick forest. When a post office was opened it was named Sheridan, but local usage preferred Kyabram, which prevailed when the railway station was opened in 1887. Before Kyabram was laid out, an informal village named Henley existed about 2 km south-east of Kyabram. It had a primary school (1880) as did Kyabram South (later Cooma), which was the earliest school in the district (1875). Henley also had funds for a public hall, which were passed on for the mechanics’ institute in Kyabram (1891). By then Kyabram had four churches (Anglican, Methodist, Catholic and Presbyterian), three hotels, cordial and coach factories and several stores. Prosperity in orcharding was patchy, with rail transport costs occasionally exceeding wholesale prices paid to growers. 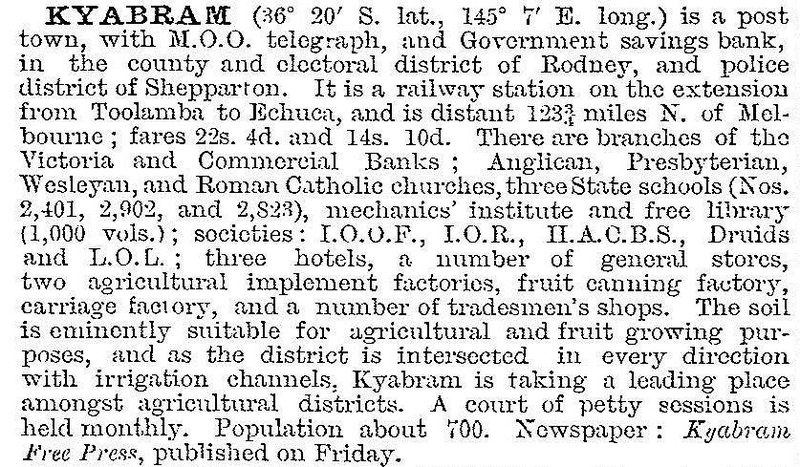 Nevertheless, soldier settlers took up more orchards after 1918, and an abundance of supply led to the formation of the Kyabram co-operative fruit cannery (1922). The cannery was joined by a can-making factory in 1950. In 1924 a local politician who had lived in Kyabram since 1873 was elected Victorian Premier. He was John Allan, Australia’s first Country Party premier. Allan had been associated 20 years before with the Kyabram Reform Movement, a political campaign which succeeded in reducing the number of State Parliamentarians. Between the 1920s and World War II Kyabram gained a cinema (1927), State-generated electricity for its butter factory (1926) and a council stock saleyard (1937). After the war the progress association was revived, and in nine years it supported a co-operative housing project (345 dwellings), public health improvements, a swimming pool and severance of Kyabram from Rodney shire. The association and the agricultural society staged an annual rodeo for several years. Italian migrants and war internees settled on farms in the district. The growth in population put strain on the bush nursing hospital (1933) and in 1960 the Kyabram District Memorial Community Hospital was opened. A high school was opened in 1955. Kyabram was declared a borough by severance from Rodney shire on 1 April 1954, and it was proclaimed a town on 4 July 1973. Between the end of the war and 1970 the population of Kyabram more than doubled to 5000 people. In the next 25 years the population further increased, but only by 700. Kyabram has two State primary schools, a secondary college, Catholic primary and secondary schools, a hospital, a retirement village, two recreation reserves, a swimming pool, a showground, a trotting track and a caravan park. Kyabram has a strong shopping area (11,200 sq metres, 1986). Kyabram’s industries in fruit (co-operative cannery), and textiles (John Brown), have closed. The Kyabram fauna park partly makes up for the loss of those industries. The Kyabram P-12 college had 1024 pupils in 2014. Fruit and beverage factories are supported by an Amcor cannery plant. The Henry Jones/IXL factory was acquired by SPC/Ardmona in 2004, and both were acquired by Coca Cola/Amatil in 2005. The Kyabram Irrigation Research Station (1959) was closed in 2008 and its operations transferred to Tatura. On 18 November 1994, Kyabram town was united with Echuca city, Deakin shire, most of Rochester and Waranga shires and part of Rodney shire to form Campaspe shire. Kyabram was also well known for Banksia Securities Limited (1966), a borrower and investor that looked like a bank, but was not subject to bank supervision. It was well supported by local people (15,000 lenders) and had offices in Echuca, Shepparton and Tatura. In October 2012 it went into receivership. A class action was lodged in 2012, and a loss of $340 million was expected, out of investors’ funds of $662 million.